Glorious views of the Sunset Amphitheater with perfect conditions. Very warm conditions with snow starting at ~4600' between Tahoma Creek suspension bridge and Indian Henry's Hunting Ground (restroom behind ranger cabin is snow free). Running water available in Pyramid basin. 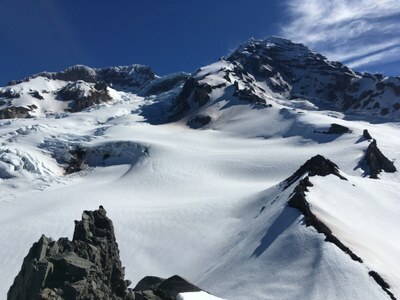 Perfect glacier conditions on Sunday, although negotiating a way between the impressive crevasses on the South Tahoma Glacier might be problematic in another month. The ridge leading down to where the Wonderland Trail cross Emerald Ridge is completely snow free. Glorious views. Climbing permits purchased online and arrival at Longmire WIC 30 minutes before opening allowed us to be hiking by 8:30AM. Very warm conditions with snow starting at ~4600' between Tahoma Creek suspension bridge and Indian Henry's Hunting Ground (restroom behind ranger cabin is snow free). Running water available in Pyramid basin and we took a 40 minute nap atop Point 6631 on our way to the campsite at ~8100' on Success Cleaver. Perfect glacier conditions on Sunday, although negotiating a way between the impressive crevasses on the South Tahoma Glacier might be problematic in another month. The ridge leading down to where the Wonderland Trail crosses Emerald Ridge is completely snow free. Back to cars by 3PM on Sunday. Photos (including route map) can be seen here.